The iAdapter Mini for Apple's first, second and third generation iPad Mini was one of our favourite AAC platforms for iPad. The case was ergonomic and durable, had great design and most importantly, amplified your AAC and Speech Gernation apps brilliantly. For a case of it's size, it was one of the best value for money AAC accesories on the market. Advanced Multimedia Devices, Inc. (AMDi) have taken an opportunity to look at the iAdapter Mini and in the second generation have improved upon that unique platform with inclusion of an option for the latest iPad mini 4 into the family as well. A top runner for ourt Product of the Year, we think it's that good. 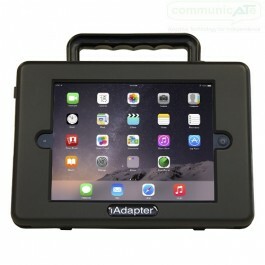 The iAdapter™ Mini 2 and iAdapter Mini 4 are amplified cases designed for use with their corresponding iPad Mini models. It is fully compatible with the iPad® mini 1st - 3rd generations (iAdapter Mini 2) as well as iPad Mini 4 (iAdapter Mini 4). AMDi have completely redesigned the iAdapter Mini so that it now has all the advantages of the bigger iAdapter 5 model, but in a smaller package. The case is made to be more durable than its previous model and now uses Bluetooth® audio technology for clear and loud output of your AAC apps - a feature we think is quite important when using an iPad as a speech generatring device! Along with ample volume, the case itself is compact and ergonomic with in-built portability options. Includes in it's design are a fold-away handle, shoulder strap attachment points, screw holes for DAESSY, Mount'n Mover or REHAdapt Mount Plate attachment so no matter how you iAdapter Mini is ported around, it has all the options covered. An optional carry case completes the picture. Your iPad is also protected from the day-to-day experiences of life too. The iPad Mini sits on specially shaped internal rubber bumpers that cushion the iPad inside the case and also ensure your iPad fits perfectly. Once installed and the top and bottom halves of the case are screwed together, your iPad is encased in a hard plastic shell and protected from any incidental or accidental impacts. Of course, iAdapter Mini can only protect your iPad Mini to a limit, so if you're if a higher level of protection of your iPad is your top priority or you feel your iPad will be at high risk of damage, maybe options life those from Lifeproof, Griffin, Otterbox et al are more suited. iAdapter Mini is designed to offer protection of your iPad Mini however it is also offering portability and amplification as an AAC/SGD platform and balances all those features together. iAdapter Mini 2 and iAdapter Mini 4 use your iPad's Bluetooth technology to connect it's speakers. It's one of the highlighted improvements of the second generation iAdapter Mini, with the volume output and clarity ticking boxes as a speech generating device. Whether that's using an AAC app or Apple's built-in Speech Output, iAdapter Mini's bluetooth audio is a stand out feature. If required, you can still connect other bluetooth technologies like keyboards or switch interfaces as the audio and other external accessory channels are separate. Alternatively, if you need built-in switch access there's also the iAdapter Mini with Bluetooth Switch Access models to choose from, let your iAdapter Mini connect both your audio output and your switch instead of wrangling separate peice of technology. Weight is approx. 900g with iPad installed - very light!